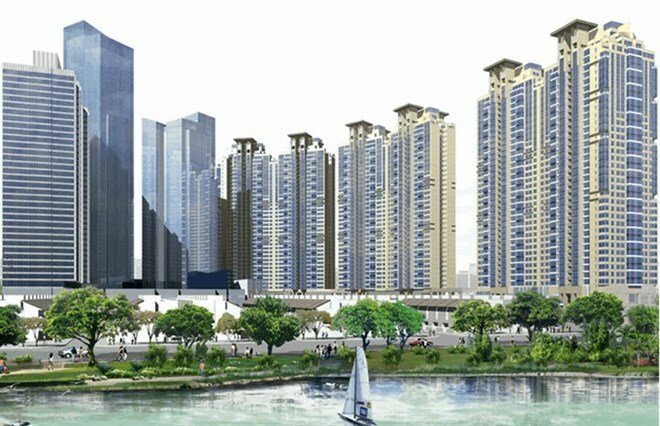 New high-rise buildings on Nguy​en H​uu C​anh Street in HCM City’s B​inh Th​anh District. HCM City (VNA) – Ho Chi Minh City will not grant licences to high-rise construction projects on roads and in areas where planned infrastructure projects have not been completed in an effort to relieve congestions. Apartment buildings have been built in many areas where roads have not been graded and enlarged. Five apartment buildings on a 1km stretch of Trinh Dinh Thao Street between Tan Hoa Canal four-way cross-roads and Luy Ban Bich four-way cross-roads have exerted pressure on infrastructure in Hoa Thanh ward in Tan Phu district. A representative of the city’s Department of Construction said in many areas building projects had surpassed the capacity of infrastructure and social development. He said that new apartment building projects in residential areas built decades ago had affected poorly developed transport facilities and water supply networks, he said. According to a source from the city’s Department of Transportation, authorities have not sought opinions from the department on the planning of apartment buildings. As a result, new high-rise apartment buildings on roads which have yet to be upgraded and enlarged have exerted rising traffic pressure on many densely populated areas. Tran Quang Lam, deputy director of the HCM City Department of Transportation, said that the department has asked investors of these apartment building projects to submit reports on transport impact and plans for enlarging roads to reduce traffic congestion. Prof. Nguyen Trong Hoa, ex-chief of HCM City Institute for Development, said that experts had also asked city authorities to delay licensing high-rise building projects located on main road axis in the downtown area as infrastructure is overloaded. However, Hoa said that licences had been granted to new high-rise building projects under a plan of 20 years later when seven metro routes and underground parking lots would be built. Dr Nguyen Van Hiep, ex-deputy director of the city’s Construction Department, said the laws on assessment of environmental impact should be changed.